How much fork oil is required I have read 230cc and 250cc Also is the procedure for refilling documented anywhere? use a Hite Rite to measure out what you need..
How much preload is too much preload? I found a couple of spacers around 2.5 cm long at the top of my forks when I disassembled them. I'm wondering if the previous owner found the springs to be shot and went down this road as opposed to replacing them. Got these in my '80 900SS - leave 'em in, as I found that without them, the front end takes on the feel of over-cooked pasta!!! One more question. I had the front forks right off and disassembled when I rebuilt them. They needed a pretty good cleaning, One thing I notice now is that the centre shaft for the triple clamp seems to have slipped down a bit. I used a rubber mallet when 'tapping' the triple clamp back onto the forks. At the bottom of the triple clamp I think the centre stem is protruding too far down. How far should this protrude? Do I need to tap it back in until the lip? It seems like the whole steering column could loosen. Are you sure it's moving? The stem is tapered and pressed into place with considerable force so they're a pretty tight fit. The part to can see protruding is supposed to be protruding. The steering stop plate usually slips over it. I can't see how the stem could drop because it's screwed together by the crown nut, the adjuster and then both triple clamps are locked by their own bolts. Unless someone starts bashing it down wards it shouldn't come out. Have a look at an exploded parts diagram and you'll see what I mean. I'm not sure it moved but it seems that there is too much protruding. I had the forks completely disassembled and rebuilt them. When I was putting the lower part of the triple clamp back on the forks I tapped it into position with a rubber mallet. 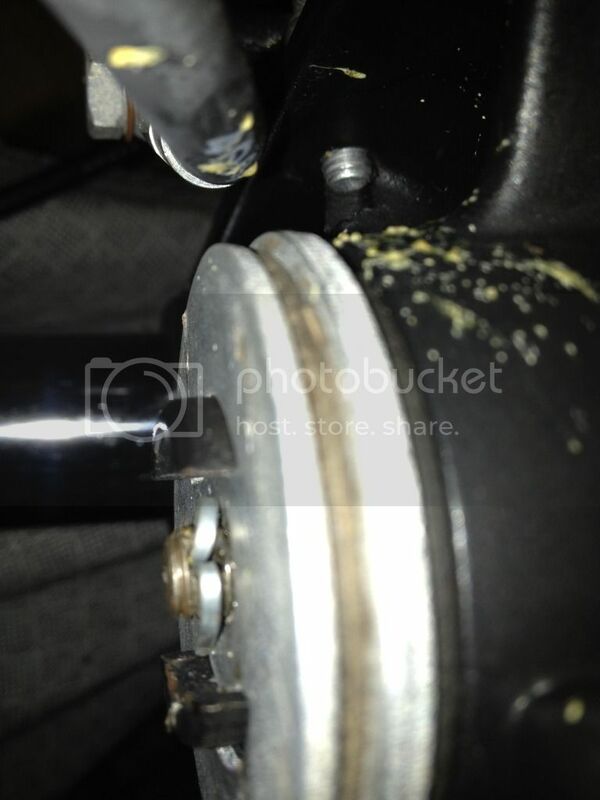 The washer and nut for the steering damper are way to sloppy now so it seems like it did slip. I was hoping that someone could take a peak at theirs. I suspect I need to tap the centre stem back up with the steering stem completely disassembled and then snug everything back up. Are you saying you removed the stem? You'd need a press to do that. Mine protrudes the same amount. Is it loose? Yours looks normal to me. No I didn't remove the stem. I had the chance to measure the protrusion on someone else's 900ss and it was 12mm. I'll measure mine today. I'd agree that you don't have that in the right relative position. Did you play with head stock bearings at all? Perfect!!! The lower washer was not sliding over the bottom lip on the stem. I had to tap it home a little harder to get it to seat and everything snugged up nicely.